One feminist sound bite that has emerged loud and clear over the past few years is that genre stories need more “strong female characters.” And that’s true. According to one 2017 study of 900 top films, “there were on average 2.3 male characters for every woman, with no meaningful change from 2007 to 2016.” But as Crazy Ex-Girlfriend’s Rebecca Bunch would say, “The situation’s a lot more nuanced than that.” When it comes to female representation in Hollywood there are really three different problems at play: The first and most obvious is that genre stories are lacking female leads. The second is that genre stories, regardless of whether or not they have female leads, are lacking female supporting characters. And the third, and hardest-to-spot problem, is that when there are multiple female characters, they’re seldom allowed to interact with one another. Spooky fan favorite Stranger Things provides the perfect case study for that third problem. At first glance the show’s second season seems to have decent female representation. Eleven, Nancy, Joyce, and Max are fairly different (although notably, all white) female characters, each with at least some sort of arc and a relatively good amount of agency. Yes, male characters outnumber female characters 2-to-1 on the show, but by Hollywood standards it could be far, far worse. 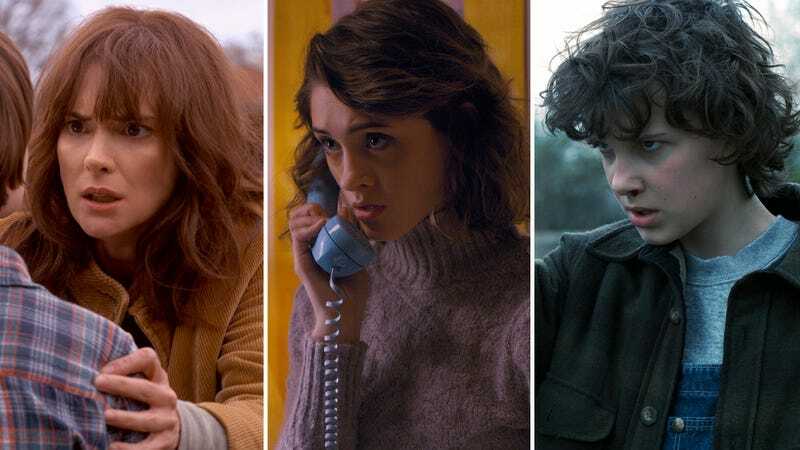 But a strange thing (pun intended) emerges when you start to examine Eleven, Nancy, Joyce, and Max’s storylines in the show’s second season: The four main female characters share virtually no screen time together. Stranger Things 2 may star multiple women, but in practice they just wind up being the sole Smurfettes in their own male-centric storylines. Joyce spends the season with Bob, Hopper, Jonathan, Will, and Dr. Owens, trying to figure out what’s wrong with her youngest son. Nancy is having relationship problems with Steve while seeking #JusticeForBarb with the help of Jonathan and conspiracy theorist Murray. Max is either dealing with her abusive older brother, Billy, or tagging along with Mike, Will, Dustin, and Lucas. And Eleven spends the vast majority of the season either alone in a cabin or fighting with her new pseudo-father figure, Hopper. There are some notable exceptions in the latter half of Eleven’s story—more on those in a bit—but it’s easy to watch Stranger Things 2 and never realize that the show’s four main female cast members barely interact with one another. And that’s because we’re so used to seeing this kind of storytelling. Yes, we need more female genre leads, but the fact is Hollywood has also been writing them for a while now—from Princess Leia in Star Wars to Ellen Ripley in Alien to Sarah Connor in The Terminator. What we see far less frequently is female genre leads who actually interact with other women. Rey and Leia both exist in Star Wars: The Force Awakens, but their interactions boil down to a hug and one line of dialogue. Felicity Jones’ Jyn Erso, meanwhile, doesn’t even have the luxury of female supporting characters to not cross paths with in Rogue One. The Harry Potter series seldom has Hermione Granger speak to other women. Arwen, Éowyn, and Galadriel exist in entirely different corners of The Lord Of The Rings universe. And I’m pretty sure that, to this day, the only live-action superhero movie that features two female heroes going off on a mission alone is 2003’s X2. Stranger Things 2 may star multiple women, but in practice they just wind up being the sole Smurfettes in their own male-centric storylines. So what we’re left with is a situation in which live-action genre storytelling either centers on men interacting with men or men interacting with women. The obvious constant there being men. It’s incredibly rare that genre storytelling doesn’t have a male point-of-view character. Even something as explicitly feminist as Wonder Woman is in a desperate rush to get Chris Pine on screen and keep him there as much as possible. And that’s a problem for a whole bunch of different reasons. For one thing, it’s bad storytelling. Women make up roughly 50 percent of the population, and, yes, real-life women frequently interact with each other and frequently do so without a male chaperone around. So to treat women like isolated diversity sprinkles is as unrealistic as setting a bunch of TV dramas in 2017 but only giving cellphones to one or two characters. Could you justify such a storytelling limitation? Sure. But why would you choose to do so over and over again? Or consider this: If Hollywood suddenly put a moratorium on father-son stories, we’d probably feel cheated out of potential storytelling opportunities. So why do we accept it as the norm that genre films rarely tell stories about mothers and daughters? (Mother-son and father-daughter stories are a bit more common because, again, they contain at least one male character.) If we think of male-male interactions, male-female interactions, and female-female interactions as three separate storytelling elements, then Hollywood has basically closed off a third of potential storylines right off the bat. Stranger Things 2 gets a ton of mileage out of unexpected character pairings like Steve and Dustin or Hopper and Eleven, yet it never occurs to the writers to try pairing any of the show’s main female characters together. Which is especially disappointing because one of the highlights of the first season was the brief but caring relationship between Joyce and Eleven. In season two, that relationship is reduced to a single hug, à la Rey and Leia. The reality is, the average genre viewer just isn’t asked to spend much time watching scenes that solely feature female characters. Even female-led genre stories like Wonder Woman, The Hunger Games, or Star Trek: Discovery don’t often demand that of their audience—at least not for extended periods of time. I don’t mean to suggest that male audiences can’t empathize with Diana Prince, Katniss Everdeen, and Michael Burnham just because there are men on screen too. But on the whole, male viewers aren’t expected to engage with the fullness of the female experience in the way that female viewers are expected to engage with the male one. We’re complicit in this weird mass cultural lie about what women’s lives are actually like. And that brings us to the social argument for the need for more female representation: The lack of onscreen female relationships can have negative repercussions on how both men see women and women see each other. For instance, Dustin and Lucas get to hash out the nuances of their jealously issues over the course of multiple episodes. Eleven and Max aren’t even given a single scene to deal with their own. That feeds directly into the idea that men are complex, flawed human beings while women are just irrational and petty. Now let’s dig into those exceptions I mentioned earlier, because they help demonstrate how complicated issues of representation can be. In the latter half of Stranger Things 2, Eleven first tracks down her mother and aunt and then spends the entirety of the show’s seventh episode getting to know her superpowered sister. I imagine some will point to those interactions as evidence that Stranger Things isn’t nearly as disinterested in its female relationships as I’m making it out to be. And, yes, I do give the Duffer Brothers credit for at least trying to explore Eleven and Kali’s complex sisterly relationship, even if it took place in a rather artistically dubious episode. But the female-centric portion of El’s journey takes up an episode and a half of a nine-episode season. To frame that as a big win for female-centric storytelling is to lower the bar almost to the floor. But it’s easy for us to feel like women are taking up more space than they are—both in fiction and in real life. Australian scholar Dale Spender found that, “[In] seminars and debates, when women and men are deliberately given an equal amount of the highly valued talking time, there is often a perception that [women] are getting more than their fair share.” And I think something similar happens with movies and TV shows. Before the release of Guardians Of The Galaxy 2, writer-director James Gunn proudly claimed that the movie would “not only pass the Bechdel test, but run over it and back up over it again and again in an eighteen-wheeler truck.” Yet when I timed the movie myself, I found that the 138-minute film featured just four and a half minutes of female characters talking to one another (only 30 seconds of which I’m 100 percent sure pass the Bechdel test). The other tricky thing about critiquing female representation on a case-by-case basis is that there’s often some individual justification: Game Of Thrones is specifically depicting and critiquing patriarchy, Stranger Things is telling its story through the lens of middle school boys, Rogue One is trying to match the male-heavy aesthetic of the original Star Wars films, Star Trek: Discovery is… well, that one doesn’t really have an excuse. But then the question becomes: Why do we keep finding reasons to tell stories in which women are isolated from one another? Why are we more comfortable putting female characters in male-heavy environments than we are telling truly female-centric stories? That doesn’t mean that every piece of entertainment has to have strict gender parity in its relationships. There can and should be series like Orange Is The New Black that take place in mostly female environments and films like Saving Private Ryan that take place in all-male ones. But if the goal of genre storytelling is to explore broadly human stories through a fantastical lens, we could use a radical shift in what kind of relationships exist in our faraway galaxies, medieval cities, and quaint Indiana towns.